My Puppy Won't Walk on a Leash! I was looking over a dog training and behavior forum for owners the other day and was surprised by how many topics centered around puppies not wanting to walk on a leash. I didn't investigate any further to discover if my initial mental picture of a puppy plopping down and refusing to move was what the owners were talking about, but I did realize that "puppy won't walk on a leash" could include several different behaviors. 1. Puppy refuses to move. There could be several reasons for this: 1) he's scared/overwhelmed, 2) he's distracted, or 3) he's tired. If he's scared or overwhelmed, there'll be accompanying body language signals to indicate such. He'll also likely refuse food or need coaxing to eat treats. This type of "won't walk" can only be fixed by fixing the fear. Fear in a young pup can be a very serious problem that gets worse on its own rather than better. Check out the Fearful Dogs website, and please bring in a qualified, reward-based trainer to provide individualized help--the sooner the better! If he's distracted and focusing on something else, let him look for a bit (that's important for young puppies!) and then verbally encourage him to come along with you--make sure to give him a yummy treat when he puts his rear in gear! My favorite game for teaching puppies and dogs to pay attention around distractions is Engage/Disengage. Your puppy might also be worn out. It's easy to accidentally give puppies too much exercise. 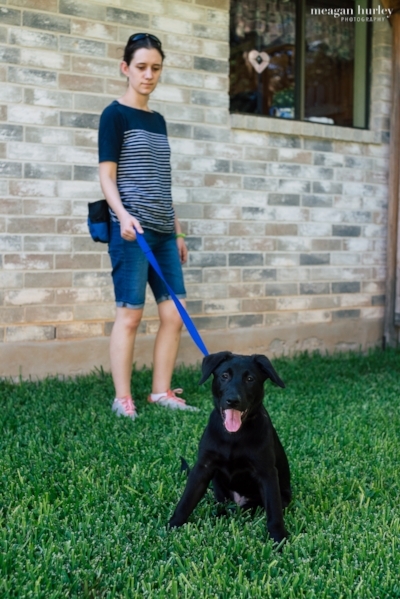 Most puppies are not ready for a typical neighborhood walk until they're 6-12 months old. Too much activity, too soon sets your pup up for injury later in life. 2. Puppy bites at the leash/harness---he doesn't seem to like it. This is relatively normal behavior. For most puppies, it's a phase they will grow out of. Using a dog tether will keep your leash from being destroyed. Take the harness off unless you’re intentionally interacting with him. You can also teach him to self-dress to help him like his harness. 3. Puppy can't seem to walk like a normal dog: he zig-zags and backtracks and starts and stops. Also normal! Think about a toddler walking through the shopping mall versus an adult walking through the shopping mall. Very different motivations, very different motor patterns, very different energy levels. Teaching him a casual heel will reduce the zig-zagging as he learns that walking by your left side results in yummy treats.